The prominent Uinta Mountains of Utah rose from Precambrian rock about 600 million years ago. These geologic giants are the northern-most high altitude massifs formed by glaciers during the Ice Age without present-day glaciers and are the longest east-to-west oriented mountain range in the lower 48. 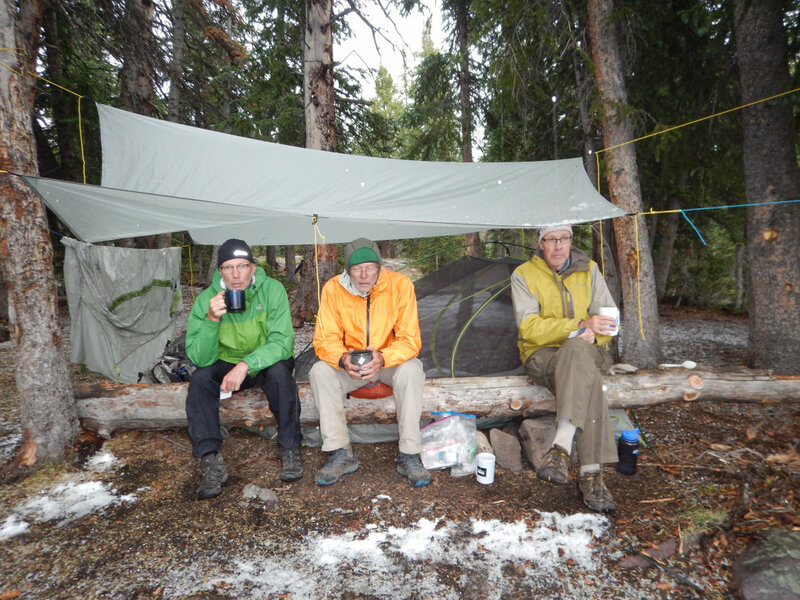 My friends Craig Benson, Bob Wenger, husband Lee, and I flew to Salt Lake City for an eight-day thru-hike on the high altitude, 83-mile Uinta (pronounced you-went-a) Highline Trail (UHT). We rented two vehicles and drove to Hayden Pass for the 175-mile car shuttle. After leaving Craig’s rental at the western terminus at Hayden Pass, Lee drove us to a basic motel in Vernal, Utah, where we enjoyed a good night’s rest before the next day’s departure at the eastern terminus of Hacking Lake (10,630-feet). 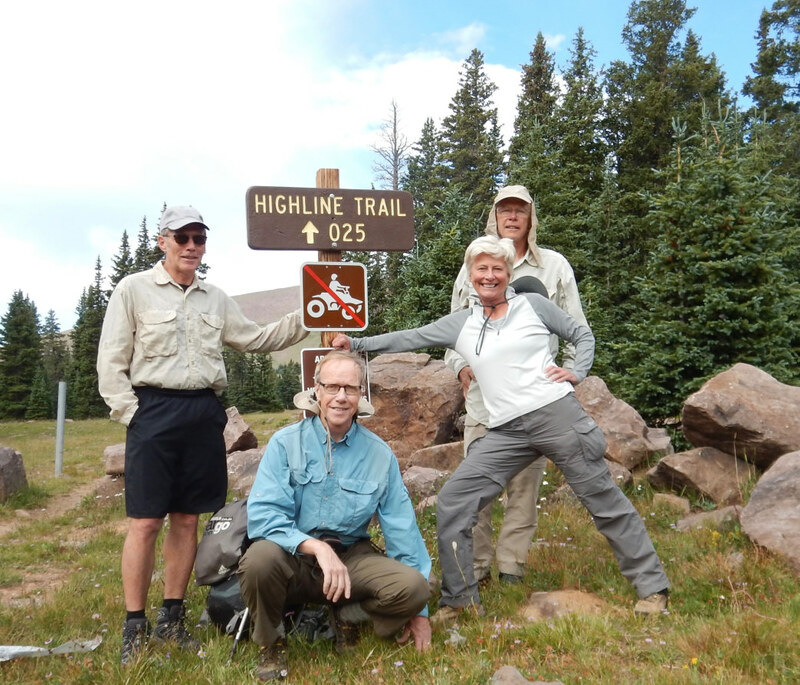 At the trailhead, I hoisted my 38-pound pack and proceeded up trail number 025. 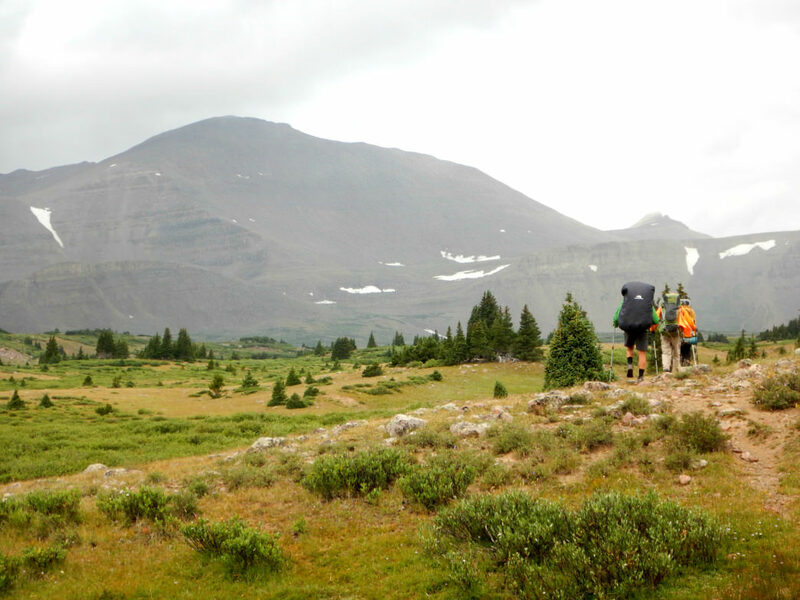 Near Leidy Peak (12,028-feet), the boys consulted the map as I passed by and walked into a dense conifer forest. I strolled along until I came to a hulking brown form blocking the path, where I stared at three pairs of eyes twenty feet ahead. I blinked. They blinked. My heart pounded as the unknown shape morphed into three female elk that bolted––one left, one right, one back. Five minutes later, dozens of elk charged across the trail. The thunderous stampede darting between fir trees kicked up a veil of fine dust. The panoramic vista at our first pass, Gabbro Pass (11,689-feet), held a commanding view of barren humpbacked mountains with ribbons of snow. Initially this shortcut made sense, but bushwhacking over uneven terrain was arduous. 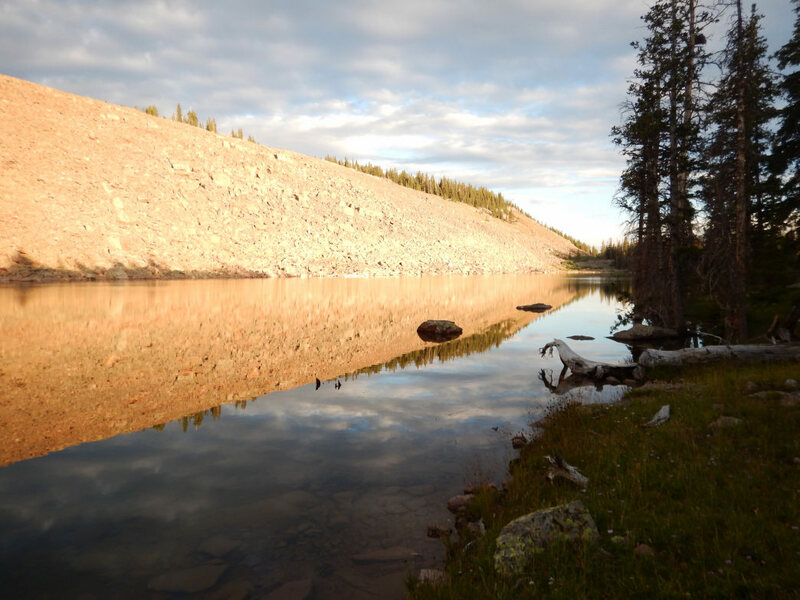 Eventually we picked up the trail again and trekked to Whiterocks Lake, then Chepeta Lake, where fly fisherman claimed the choice campsites. We were forced to go an extra mile north to Moccasin Lake. 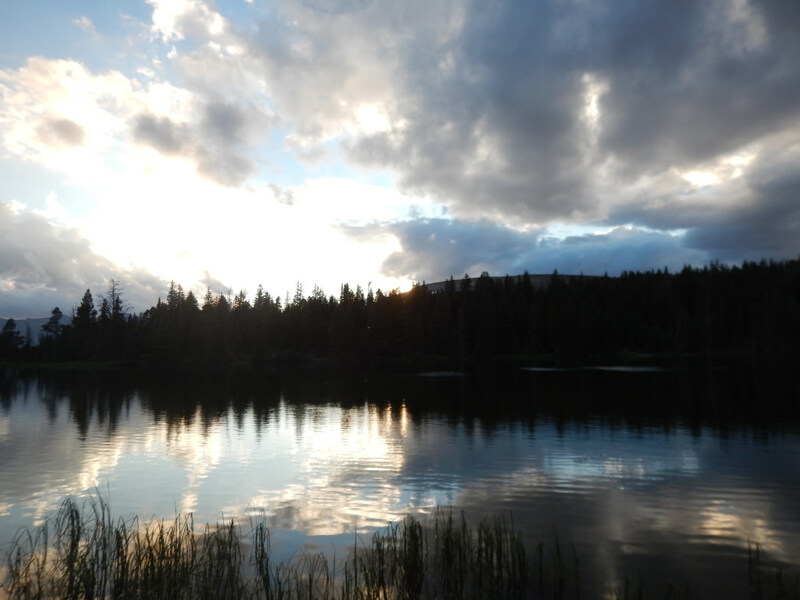 On the morning of day two, I popped the nasty, quarter-sized blister on the bottom of my heel, then retraced my steps to Chepeta Lake and set out for the marshy area of Reader Lake. On the far side of the slough, we spotted a bull-moose leisurely raise and lower his shovels underwater as he dined on breakfast. Toward noon, heavy cloud cover obliterated the sun during the climb up North Pole Pass (11,800-feet). Several false summits taunted us until we finally reached the top where strong winds were swirling. Scrambling over the summit, I descended to Brook and Fox Lakes in an isolated thunderstorm. I plopped down on a soggy log near the foundation of an dilapidated log cabin in a light hail shower. At a tributary of the Uinta River, a second hailstorm covered the ground in tiny white balls of ice. My feet throbbed, my back ached, and this second day of “boot camp” was miserable. I dropped my pack, sat on it, ate some nuts, drank water, and took Ibuprofen. I felt better and once again hit the trail. Two moose—a mom and her baby—traversed an expansive meadow. They sauntered toward us until mom caught wind of us and dashed into the conifers. We arrived at Kidney Lake after a difficult eleven-hour day. After midnight, the sky cleared and the August Perseid meteor shower was on display with dazzling, light blue smoke tails of shooting stars. On the third day, we walked to the expansive Painter Basin where another storm cut our day short. The fourth day’s crisp, clear morning was invigorating as we hiked the steep ascent to the UHT’s overall high point at Anderson Pass (12,700-feet). Many day-hikers merged onto the UHT from the north via the 27-mile Highpoint Trail near Mountain View, Utah, with a single goal of bagging the state’s highest point of King’s Peak (13,528-feet). I sat below Anderson Pass and tracked my husband Lee in his blaze-orange jacket as he ascended the 1,000-foot spine above the shoulder of the pass to the summit. Lee estimated that he would take two hours for the scramble to the summit, so Craig, Bob, and I pressed on toward the second pass of the day––Tungsten Pass. Beside the splotchy green grass of Yellowstone Creek, I met a dozen students from Earlham College in Richmond, Indiana taking a 12-day orientation trip. The mostly female freshmen, led by two chaperons, were on their first-ever wilderness experience. From the top of the pass, we saw North Star Lake in Garfield Basin and Craig’s olive and gray tent hugging a windblown patch of shrub. At camp, Lee had the stumbles and bumbles because of a taxing ten-hour, two-pass, and one-summit day. On the fifth day, we hiked to Porcupine Pass (12,236-feet), then descended the crumbly, loose scree slopes toward Lambert Meadow. The gray-white pyramid peaks of Scout (12,855-feet) and Explorer (12,708-feet) were in sharp contrast to the adjacent red rolling caps. When the UHT (also called the Ashley Forest Trail) in Lambert Meadow intersected the Lake Fork River Trail, we turned northwest into an Oz-like landscape. The scenery became more dramatic with warm-red peaks, chiseled mountainsides, and turquoise lakes that winked in the sunlight. We camped beside the Lake Fork River in an area that was a tinderbox full of deadfall. After dinner we played the Bocce Ball game that Bob had lugged. The sixth day was another double pass day. After bushwhacking through unmarked terrain, we found the cairn marking the path up the distinctive Red Knob Pass (11,975-feet). A boulder scramble gave way to a very faint path. Bob called out, “I found the dead horse.” Resting on a rock was the skull of a horse with most of its teeth. The boys moved steadily, and I lost sight of them. Leaning into the sharp slant of the incline, I planted both hiking poles into the loose scree before positioning one foot in front of the other. I continued this slow, methodical, baby-step pattern. I came to a junction and couldn’t tell which sketchy path led to the pass and which was a ghost trail. As I weighed the options, I saw Lee coming for my pack. At the apex, he dropped my pack, grabbed his, and headed down to get out of the freezing wind tunnel. I wanted to enjoy the vista, but I was nearly blown off as I clicked some photos before rounding the bend. I dropped down the backside of the scariest pass. Eventually, I reached Ledge Lake (10,845-feet) and thanked Craig for choosing the east to west route. If I had climbed the daunting Dead Horse Pass with a fully loaded backpack on the second day, the trail might have been renamed Dead Woman Pass. On the seventh day, a wave of threatening black clouds built above the well-named Rocky Sea Pass. I moved earnestly across the wobbly sea of rocks, summited, then caught up to the boys at Pigeon Milk Spring. We were seven miles from the car, but no one was ready to re-enter civilization. Our last night was to be at Carolyn Lake, but when we arrived, the temperature plummeted 30 degrees and a series of hailstorms raged. We huddled under our trap, sipped hot broth, played trivia, and watched the heat leave the lake in wispy layers of fog. After the tenth round of mini-marshmallow-sized ice balls, we headed for Hayden Pass. At dusk, I reached the parking lot where we rejoiced, hugged, and congratulated each other. 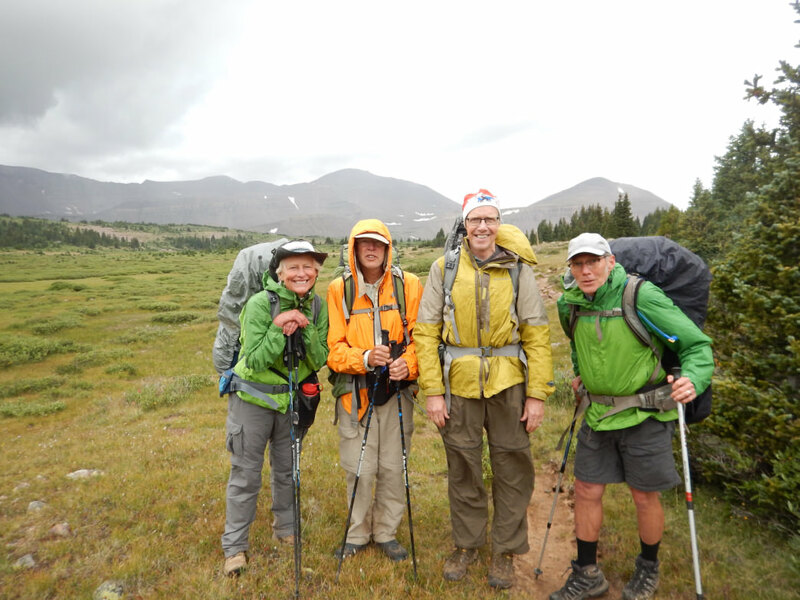 I felt an overwhelming sense of accomplishment as I neared the finish line of the 83-mile, eight-pass journey that averages only 50 thru-hikers annually. As I thought about the fact that our earth was formed 4.5 billion years ago, and the Uinta Mountains were created 600 million years ago, and the dinosaurs roamed 150 million years ago, I realized that my seven-day existence in this magnificent place doesn’t even register on the spectrum of time; however, it was a profound and humbling experience to travel atop 23 layers of geologic time––even if only for a moment.